trying to find a way into a new career. If you’ve ever looked at a “Top Ten list” of the most stressful life events, I’ve pretty much nailed 1/2 of them. All at once. It has sucked. Over the last year I have been studying off and on in the hopes of making a career switch to Information Technology. I had my first computer when I was 13 years old (that was 1983, by the way). I’ve kept up dallying in them all through the years. An individual, who I’ll call “Bart” – and I know he would appreciate that pseudonym – has emerged in my life as the kind of friend one could only hope for. As a seasoned expert in the IT Security field, he’s piled me up with books and “learn-this” lists. He’s been nothing but the perfect mentor. His entrance into my life was nothing short of miraculous. I can’t share the story in detail, but Bart, his family and I have agreed that they ended up moving back and forth 1/2 way across the country for the express purpose of having our lives reconnect. Three months ago I made the firm decision to leave the steady employment that has filled the gap since leaving my clergy career in November 2015. I finished up the California operation for that business, drove one of their trucks with equipment back to FL and on March 20 became unemployed. I had enough money to get through seven weeks of bills and expenses. If you’ve ever done that, you know the thoughts that start running through your head while you stare at the ceiling before going to sleep. You get the idea. And you know that experiencing these kinds of thoughts is not abnormal for any member of humanity in my situation. You don’t have to have to be falsely diagnosed with a Personality Disorder to admit you’re being tempted with thoughts like this. You just have to be honest. How precious also are Your thoughts to me, O God! How vast is the sum of them! If I should count them, they would outnumber the sand. However, I ended up trying to take them and the entire psalm at face value. The things that I don’t know or have not experienced about God I chose to believe were still out there. I chose to try and believe that God has precious thoughts toward me even though I don’t know what they are. 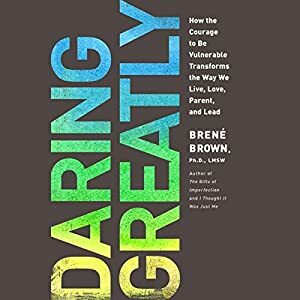 Taking Brene Brown’s challenge (see her book, “Daring Greatly” which I have been reading) , I pushed aside all the screaming indicators from people and organizations in my own life telling me I’m not worthy, and chose to consider myself worthy anyway. I concluded that night, before falling asleep, that I would believe in the Presence of God as with me personally, in that very room, at that very time, whether I felt it, saw evidence of it or not. It’s a statement about God’s thoughts. I do know some of God’s thoughts! He has told me what some of His thoughts are toward me! They are thoughts of peace toward me, not of evil. They are thoughts about going “home”, back to “my land.” They are thoughts to prosper me, to bless me. In spite of my mistakes, my sins, my failures, God is thinking well of me. He doesn’t think of those dark things at all. He has good plans for me. He considers me a worthy recipient for His good thoughts and plans. I am the object of His best thoughts. My story is not about my failures! It’s not about the trauma I’ve suffered, or the abuse at the hands of unkind people and dark organizations. My story is an Epic Drama of God’s good plans coming to fruition when He already knows all the days of my life. In the last few weeks I have been reviewing the Biblical stories of the Exodus, Israel’s time in the wilderness, and the opening battles against Sihon and Og in their conquest of Canaan. As I’ve faced my own Red Sea experience, I’ve come to see how history repeats itself: Trying to get away from slavery. 67 jobs applied for. No call backs. Head hunters calling wanting to know if I want to sell life insurance (remember Ned Ryerson from “Groundhog Day”). Recruiters from India promising to pay me $115,000/year….for “what?” And all the while the financial Egyptians bearing down on me while I’m pinned against the mountains and the sea of unemployment. On the afternoon of April 20, the afternoon of the same day I wrote the above journal entry, I received an invitation for a job interview, scheduled for 10 AM Monday morning, April 24 (three days ago). The interview went well and on Tuesday at 3:59 PM, I received a phone call from the program manager extending to me an official job offer, “Network Systems Administrator”. They offered me a pay rate higher than anything I’ve ever been paid before (even higher than my previous employer’s pay-raise offer to keep me on). When I successfully pass the next three months, they’ll bring me on as a full-benefited employee. Paperwork is being finalized this week. There is still freedom. The Red Sea still parts. Bitter waters are still made sweet. Food still falls from the sky. Water still flows from rocks. Giant evil kings with 13 foot-long beds and their entire armies are still obliterated. 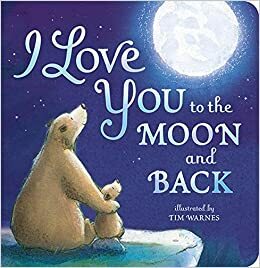 And he loves me to the moon…and back. Live long, trust God, and prosper. 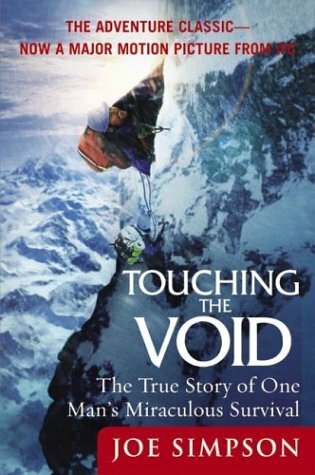 I just finished Joe Simpson’s book “Touching The Void “. I had read his story, much abridged, as told in “Deep Survival” (see below). I enjoyed that section very much, and that entire book. But that was years ago. I was unprepared for the depth of intensity and agony that Joe’s full story unveiled. “Traumatic emotions: feelings of guilt, regret, sadness and terror travel hard-wired neural pathways in a manner that mimics ingrained or archetypal fears.” – Kindle Location, 3011. When we are dealing with the disabilities caused by these traumas, we can let go of the self inflicted frustration that often expresses itself in the form of negative self talk such as, “What is wrong with me?” Reading about Joe’s panic attacks when he was back in Peru nearly two decades later filming a documentary about the accident was helpful in realizing that Joe, a very strong individual, could not simply stop the overwhelming emotions that flooded his mind as a direct result of the trauma of 1985 when he nearly died in that valley. We are dealing with very real hard-wired neural pathways that take time and repetition to rewire and redirect. The advantage we have over those with actual developmental brain damage or physical disabilities is that the mind, our minds, can actually be reprogrammed. This is the journey that a few of us are on. But for those who have made progress in that way, it is the only path to take. From the moment I leave the car the trail is up. I run. But I quickly exceed my body’s oxygen-exchange capacity which is already strained here at 6,600. I gasp for air, still trying to run, but my running looks more like the “grandma shuffle”. My heart rate is well past the target zone. I have to walk. 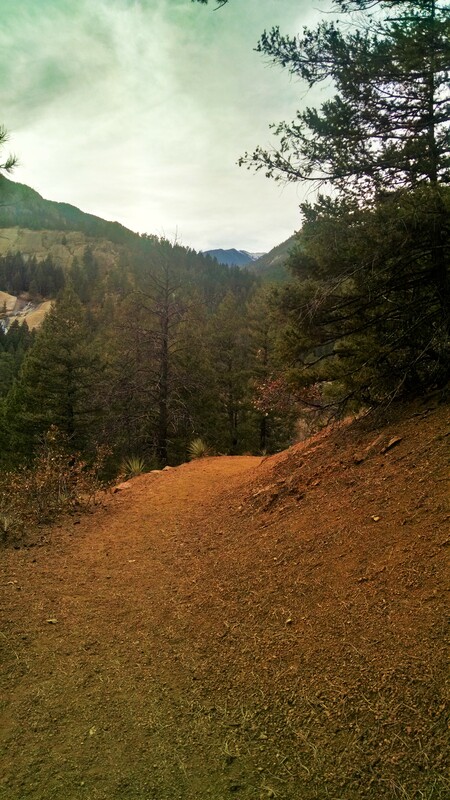 There’s a few places where the trail goes level or down for, maybe, a hundred yards. My overall pace is so painfully slow that I can’t rest on those short downhills. I have to take every opportunity for speed to mitigate against that horrific pace, now well over 10 min/km. My fastest time at sea level is 5:07 min/km. The trail rises over 800 ft in less than 3 miles. I round a corner and look up the valley, North Cheyenne Canyon, it’s called. I can see snow on the peaks ahead, the smaller sisters of the Pikes Peak herd – looking down from over 10,000 ft. above. My left knee starts to hurt. My right shin / ankle already ache. And my gasps for air echo the gasping of my soul. For hope, for respite, for something I’m not even sure of. All that is behind my soul seems so powerful to damn me. Things from 45 years ago till things from just this weekend threaten to gag my soul like the mucus that clogs my throat and threatens to choke out the little bit of air coming in. And it seems utter foolish to continue this run uphill. “Look where you’re going! You’re going no where. It’s cold up there, snow up there, LESS oxygen up there toward where you’re going. You’re a Fool.” Yes, the voices of past criticizers, and ones from even more dark and powerful places. If I listen to these voices I will stop, turn around, drop my head, walk back down to my car and find a way to end my life. I am running for my life. Because something tells me there is reason to push upward. You can’t see it with the eyes of the flesh. It looks too high, it looks too far, it looks too cold. But the thing that pushes me on is a voice more powerful than the one calling me “fool.” There is something up there you cannot see yet, you cannot hear yet, you cannot touch or smell yet. But it’s there. And it’s good. Tears run down my face. Wretched, miserable, poor, blind and naked… yes. But I am more than the sum of those things. There is Care for me up there, ahead. So I run on. And I still believe.